These are priests, deacons & seminarians who bring a vision of a just world to parishes. 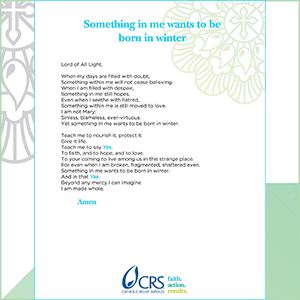 Our Resource Center is an collection of ministry tools for prayer, formation and action. 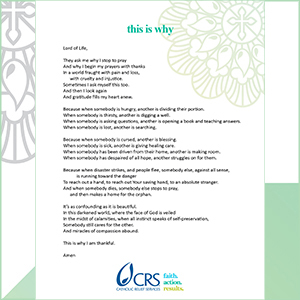 From activities and prayers to planning guides and lessons, CRS has resources around a variety of topics. CST 101 is a collaborative 7-part video series presented by the United States Conference of Catholic Bishops and CRS on Catholic social teaching. The United States Conference of Catholic Bishops (USCCB) and Catholic Relief Services (CRS) regularly raise the Church’s concerns about global poverty issues with members of the U.S. Congress, the White House and other government officials. We're shaping U.S. foreign policy through prayer, education and advocacy for the poor and vulnerable people worldwide. Love Your Neighbor by being a part of the global Share the Journey migration campaign. 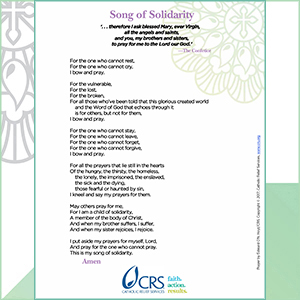 Pray, fast and give to go deeper with Christ and live in solidarity with the world’s poor. Put a human face on the cost of climate change. Help touch the lives of more than 120 million people in more than 100 countries. Find ways to give that fit your passions.